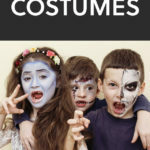 Are you looking for a cute costume for your child this Halloween? Are you struggling to come up with something you haven’t done already? If so, then do not worry. 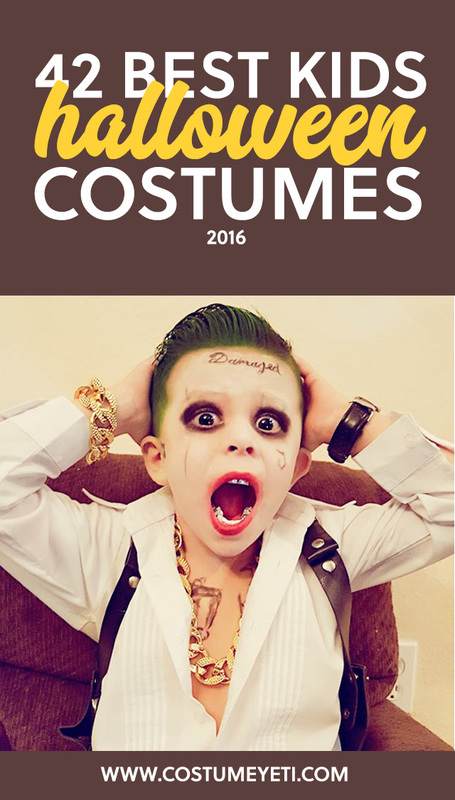 We have gathered together some of the best new children’s Halloween costumes for 2016. You should always try to be yourself, unless of course you can be a mermaid, in which case you should definitely be a mermaid! 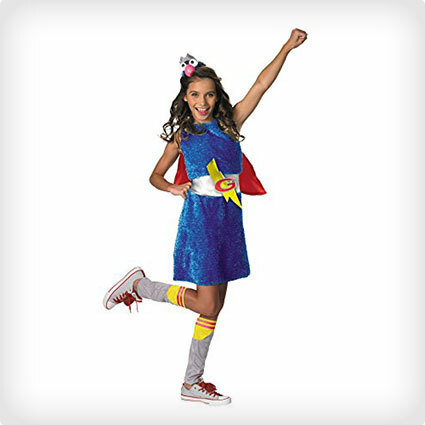 This adorable costume is one that any little girl will love. 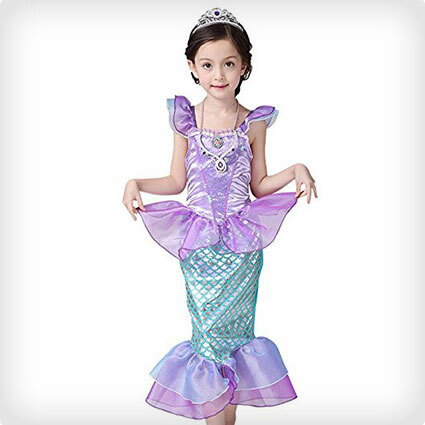 It includes a beautiful purple and blue dress with a fishtail skirt and a scale effect. It also includes a crown, because if there is anything better than a mermaid then it is a mermaid princess! If you want something a little different from the usual superheroes like Batman, Superman and Captain America, then why not consider swashbuckling adventurer Zoro instead? 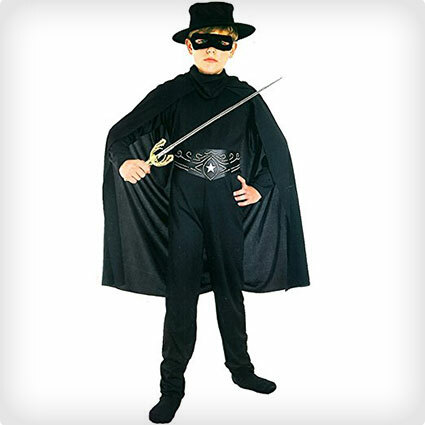 The costume includes a jumpsuit, belt, cloak, mask and scarf. One of the most popular themes for girls this Halloween is going to be Disney’s Descendants. One of our favourite costumes from this particular theme is this Maleficent costume. 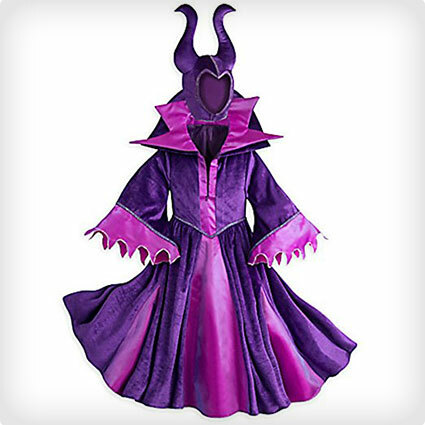 It is an official Disney product, so it is a good quality replica that features a violet coloured velour gown and the iconic horned headpiece. The most recent Marvel movie, Captain America: Civil War introduced kids to a bunch of other comic book heroes and among them was Black Panther. 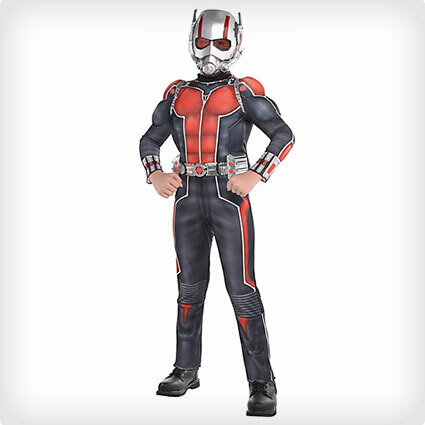 This officially licensed costume includes a padded jumpsuit with 3D boot tops and a full head mask to complete the look. 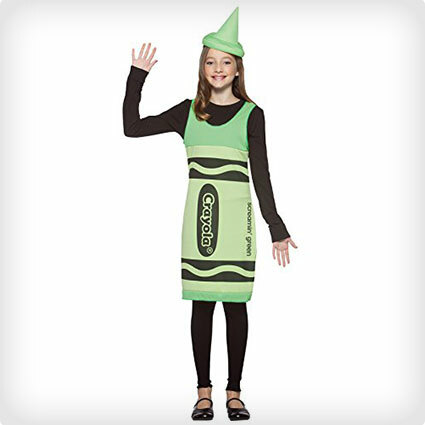 We love this cute Crayola Crayon dress and hat combo. 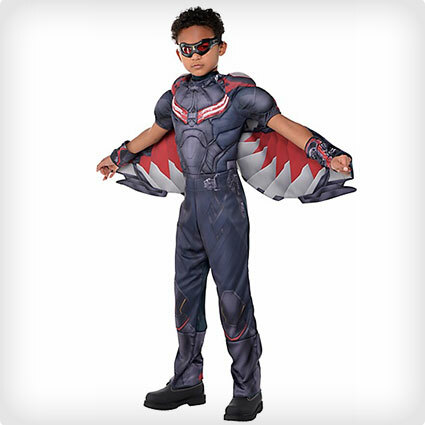 This is particularity suited to tweens who want something that is a tiny bit more grown up than most kids costumes, but it is still age appropriate. It is shown here in blue, but there are also other colors available. 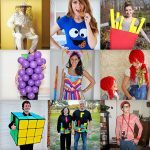 Shopkins are all the rage among girls these days, so it comes as no surprise that some cute costumes have been released in time for Halloween this year! One of our favourite costumes that we have come across is this cute Kookie Cookie costume which includes a dress and headpiece. Seasme Street is one of those kids television shows which has endured through the ages. It is every bit as popular today as it was when it first launched back in the seventies. One of the most popular characters has always been Grover, so this cute Grover themed dress is going to be a big hit at Halloween. Thanks to the release of the new Star Wars movie, we are sure to see a bit of resurgence in Star Wars themed Halloween costumes this Halloween. As well as some of the classics, there will also be plenty of opportunity for kids to portray the newer characters including Kylo Ren. Are your kids into LEGO Ninjago? If so then they will love this fantastic costume. The one that we are highlighting is Jay but other colors/characters are also available. 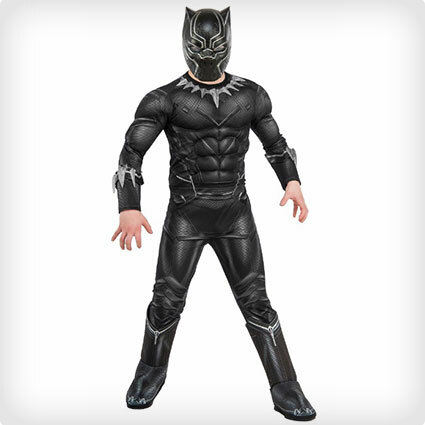 The costume is officially licensed, so it has all of the accurate detailing on the top, pants and half mask and it is supplied with lego hands to give that authentic mini fig look! Bats are something that has come to be synonymous with Halloween and this adorable costume plays homage to that. 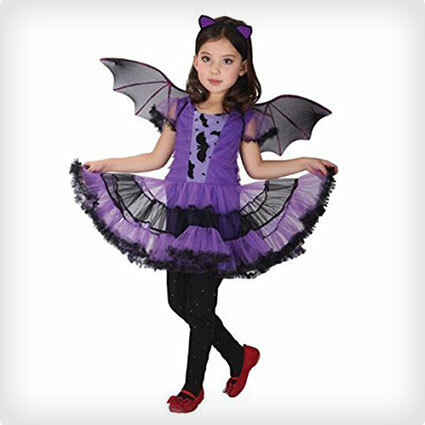 If your little girl doesn’t want to be a straight out bat then she might like this bat inspired dress which comes complete with tutu dress, wings and bat ears headband. 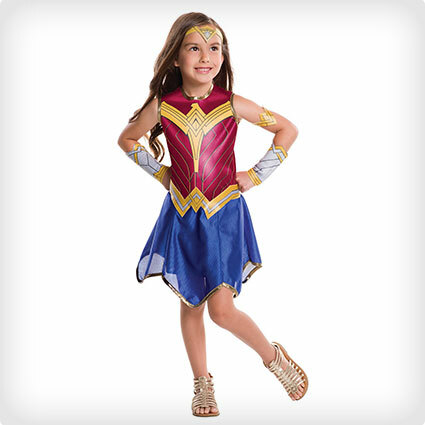 This officially licensed Wonder Woman costume is based on the costume featured in the Batman Vs Superman: Dawn of Justice movie, although it has been modified a little to make it more appropriate for a little girl. Your daughter is going to feel like a powerful Amazon princess, in this dress, tiara, gauntlets and arm bands. 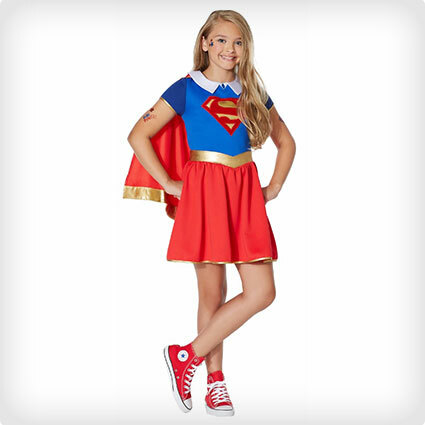 If your daughter is looking for a cute superhero costume this Halloween, then we love this cute Supergirl ensemble that comes complete with a cap sleeve dress and a detachable cape. Supergirl has seen a surge in popularity on the back of the successful CBS series, so this costume is sure to be a big hit! This adorable butterfly costume is going to be a big hit with most little girls. 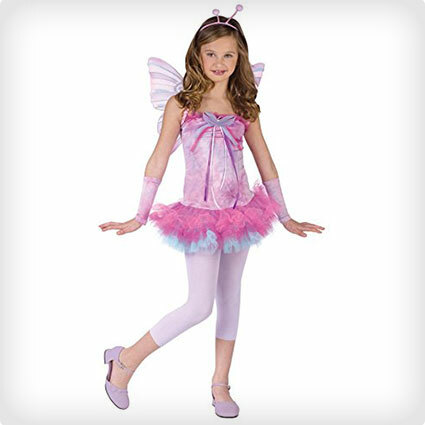 It has a pink and purple tutu style skirt, chiffon bodice and matching gauntlet, wings and antennae. 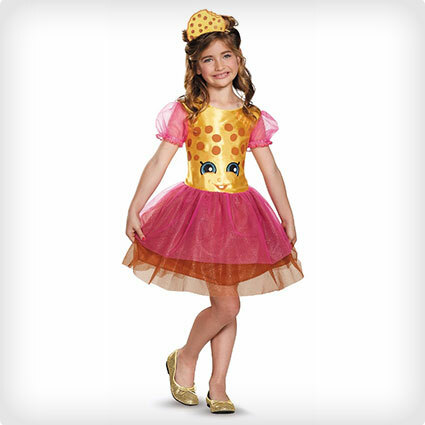 Your little princess is going to be as cute as a bug in this costume! Your child can become the King of Halloweentown with this officially licensed Jack Skellington costume straight out of Nightmare Before Christmas. 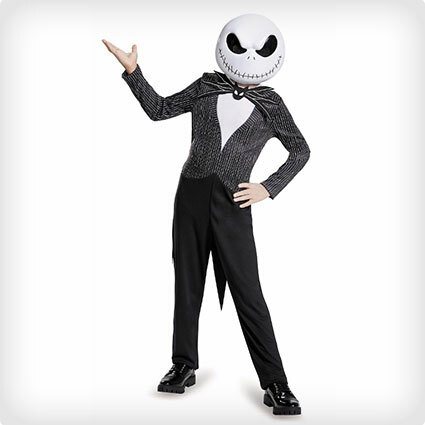 The costume comes complete with a jumpsuit with attached coat tails, Jack’s distinctive bow tie and a full mask. 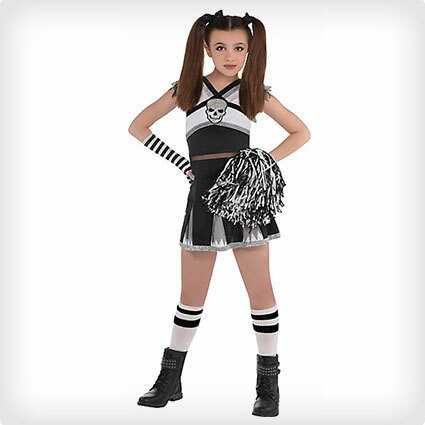 The Monster Miss costume is one that is going to suit slightly older girls in the tween to teen range. 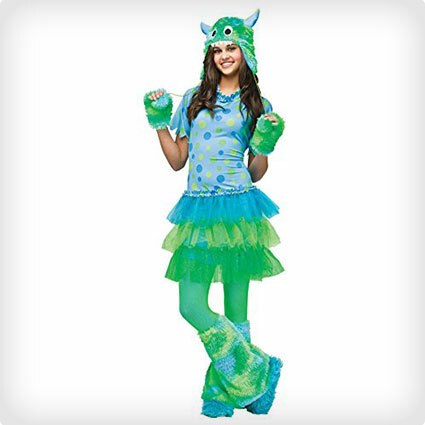 It is reminiscent of Sully from Monsters Inc with the blue colour and spot pattern, but it features a dress with a layered mesh skirt, fingerless gloves, faux fur leg cuffs and a faux fur monster hood. If you want a Halloween costume for your child that is a little bit more on the spooky side then this ghostly ghoul is going to be the ideal choice! 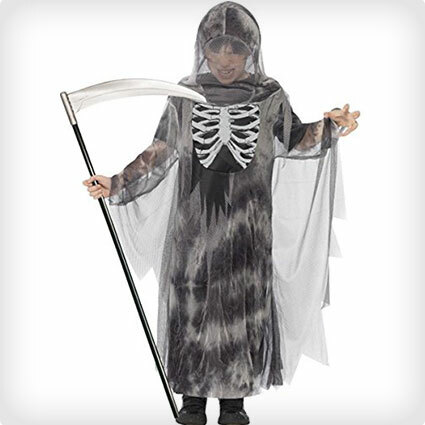 The spooky costume includes a hooded robe with glow in the dark bone detail. 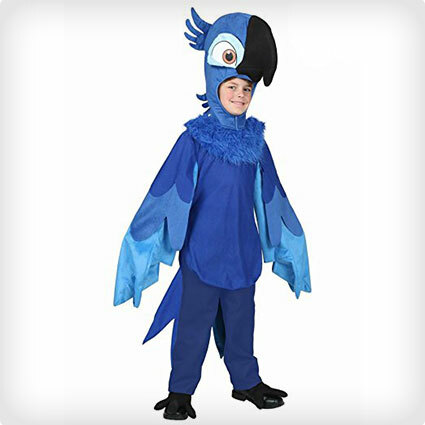 We love this Blue Macaw costume styled on the movie Rio. 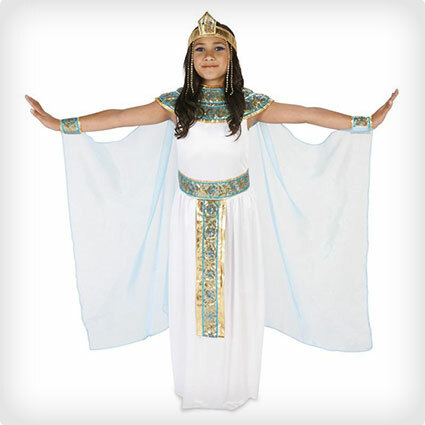 Your child is sure to stand out at any Halloween party in this cute costume. The costume is supplied with a long sleeved tunic complete with feathered detail and tail, a head with a beak and a funky pair of bird feet! 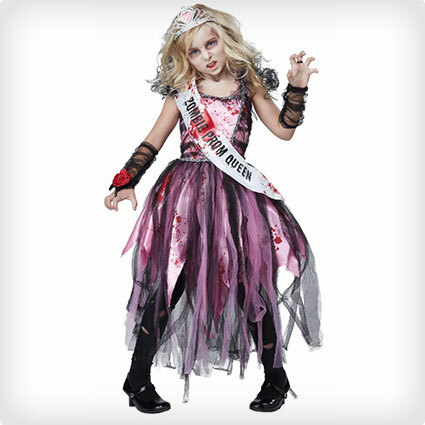 Get your kids into the scarier side of Halloween with this awesome zombie prom queen costume which is perfect for budding scream queens. 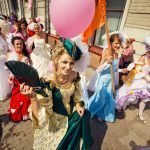 The costume includes a fantastic tattered prom dress flecked with blood, a prom queen sash, tiara, glovelettes and corsage. This is a really cute twist on the Cheshire Cat from Alice in Wonderland. Caterina Cat is a cross between the Cheshire cat and a beautiful ballerina! 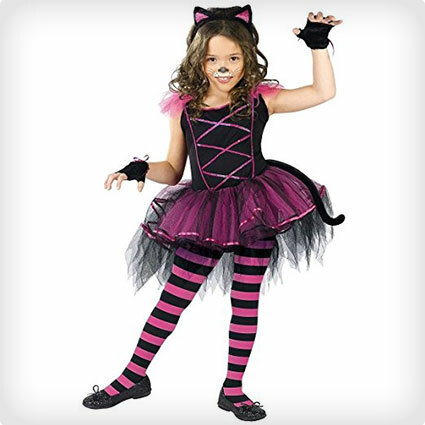 The costume includes a pretty ballet style tutu dress, mittens, a cat tail and cat ears. The striped tights are not included, but that is something that you can likely pick up at the dollar store. How cool is this skeleton costume? 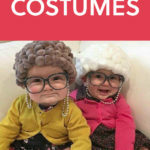 Your kids are going to love this costume! It is such a simple idea and yet it is so effective. The costume features a black morphsuit with what appears to be a white skeleton printed on the front. 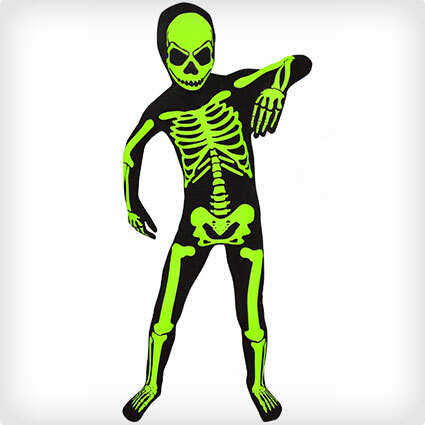 However, it is actually glow in the dark so in the darkness it just looks like the skeleton since the black will blend into your surroundings! 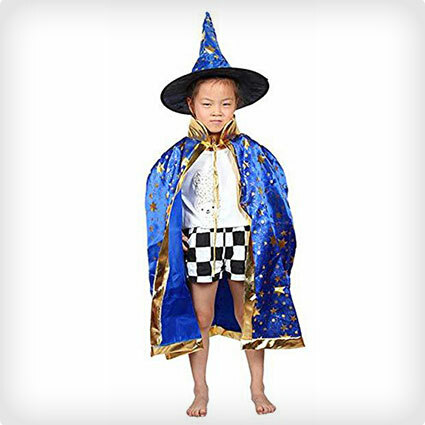 Your kid is going to be the mist adorable sorcerer around in this gorgeous cloak and wizard hat combination. Both items are made in a rich royal blue fabric scattered with golden stars. The cloak is also edged in gold metallic fabric. The overall effect is just magic. Your little girl will be a cute little devil in this gorgeous handmade Halloween outfit. The costume includes a metallic red one shoulder top and a fluffy black tutu style skirt edged in red satin. Also included are a pair of black gauntlets and some devil horns. Let your little angel show of her devilish side this Halloween. 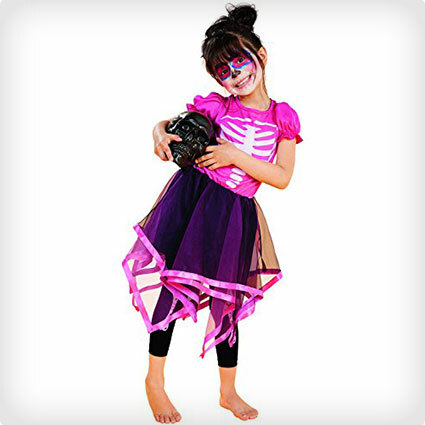 This adorable pink and black skeleton tutu dress is perfect for girly girls who still want to put a little Halloween spook into their costume. The dress has a pink bodice printed with a skeleton design and finished with a tutu style black skirt trimmed in pink satin. 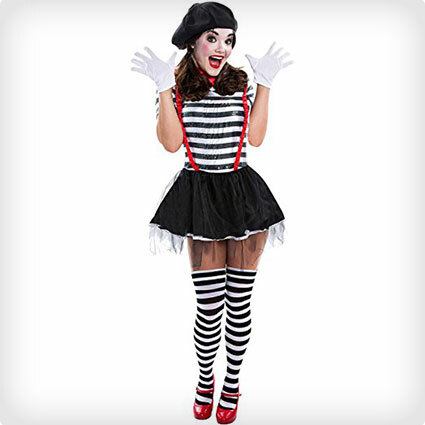 This cure mime costume is ideal for teens and tweens to dress up at Halloween if they don’t want to opt for something scary. The costume includes a dress, scarf and gloves. All you need to do is apply the appropriate make up and you have a great costume that is perfect for any Halloween event. Zootopia has been a smash hit this past year, so of course lots of kids are going to want to dress up as their favourite characters. 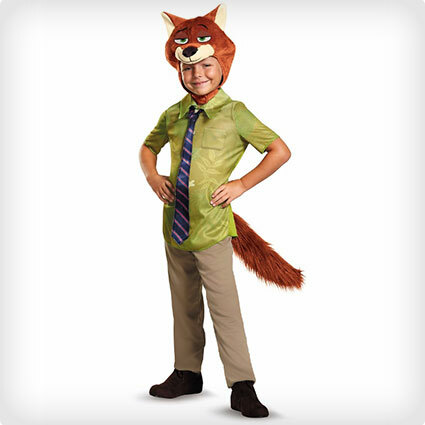 This Nick Wilde costume is just one example of the various Zootopia costumes that are available. The costume includes a shirt with attached tie, pants, tail and headpiece. 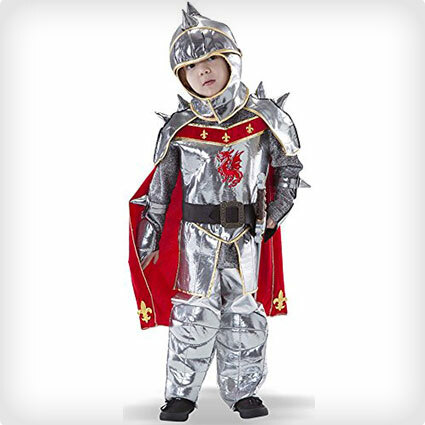 Transform your little guy into a dashing knight in shining armour with this beautiful costume. The costume includes a helmet with a permanently open visor which means that it is not going to obstruct your child’s view. It also has a short with embellished chest piece and spiked shoulders, shiny pants and a sword. That’s pretty much everything that a brave knight could ask for! As we have already noted, this Halloween is really is all about Harley Quinn. 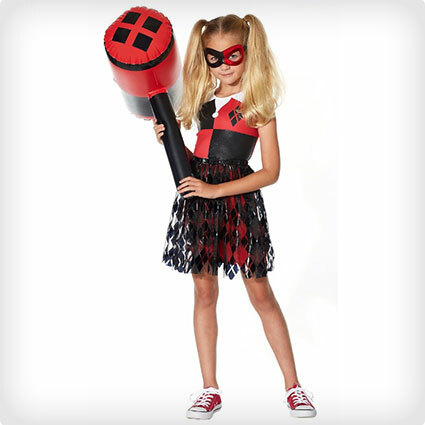 We love this costume because it is based on the latest Suicide Squad version of Harley Quinn, but it has been modified to be a little more age appropriate for a child. 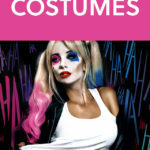 The handmade costume includes a sleeved raglan shirt with the ‘Daddy’s Lil Monster’ and a cute tutu in red and blue instead of the hot pants seen in the movie. Who doesn’t love the Minions? 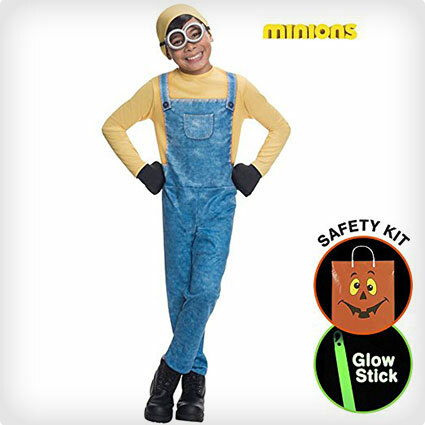 If your son or daughter is a fan of these adorable little yellow guys then they will love this Minion Bob costume which comes complete with dungarees, t-shirt, googles and hat. It also has a free safety kit with a glow stick and a reflective tote to make sure that your child is visible to traffic. Sometimes, the problem with children’s Halloween costumes is that they can sometimes be a little bit uncomfortable. That is why this altered t-shirt is a great option for a costume. This one is a Prince Charming design featuring a belt, shiny buttons, a medal and decorative epaulettes for that regal look! 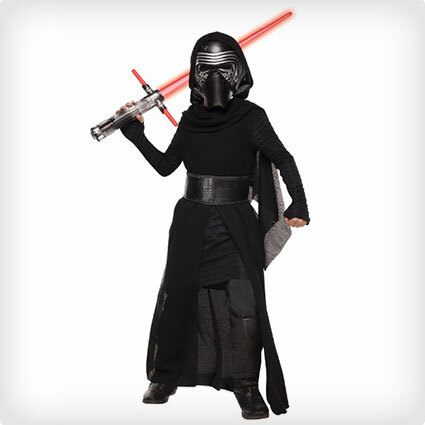 Star Wars is always a popular choice at Halloween and following the release of Star Wars: The Force Awakens, most of the related costumes have been updated for 2016. 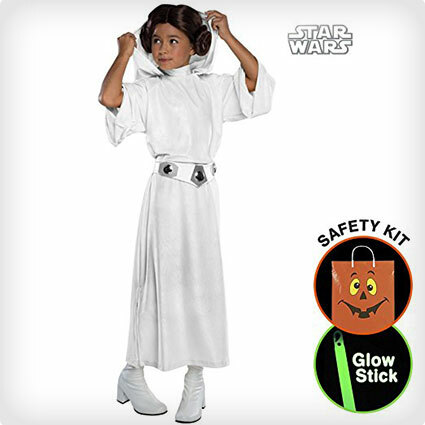 That includes this great children’s Princess Leia Deluxe costume. It is supplied complete with a glow in the dark safety kit. What could be more magical than helping your child to transform into a unicorn this Halloween. This unicorn cowl can be worn with any white clothing for a cute Halloween outfit. The cowl is made from fleece and is lined with lilac fabric to match the ears and horn. Is your child a fan of Skylanders? If so, then they will love this cure Snap Shot costume based on the Trap Team game character. This is just one of several Skylanders character costumes that are available. 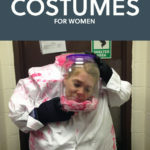 The costume includes a jumpsuit and mask and it is supplied with a free Halloween safety kit. This BB8 costume is equally adorable and hilarious! This little ball shaped robot has been a big hit since the release of the newest Star Wars movie, so we are not surprised by the demand for costumes, but we are amused by this interpretation of it! This particular BB8 costume features an inflatable body to great that round ball look! 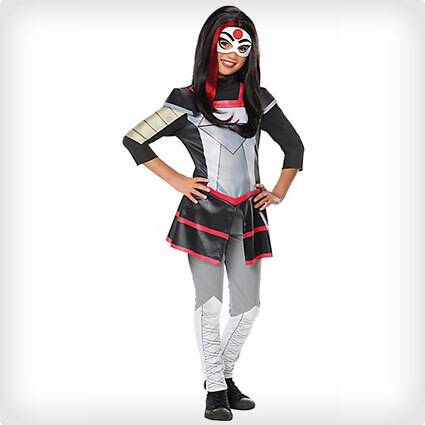 Unleash your child’s inner ninja warrior with this awesome costume. 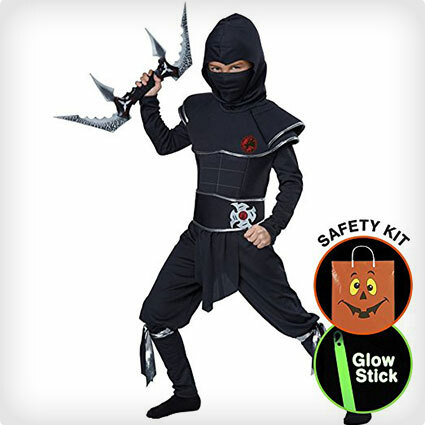 This quality costume includes a tunic, pants, belt, and mask and it is supplied with a safety kit that consists of a glow stick and a reflection Halloween tote bag to make sure that they are visible to drivers as night falls. Wow! 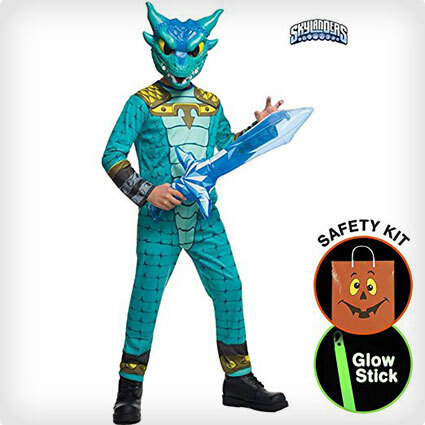 Check out this realistic looking dragon costume. 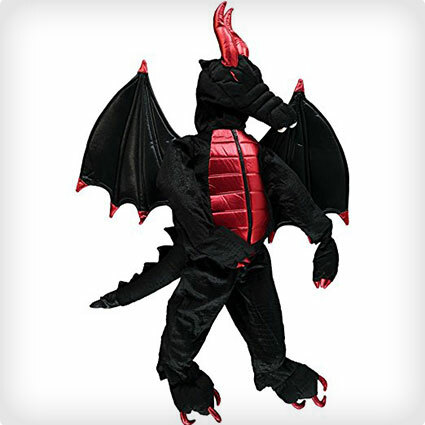 Usually the dragon costumes we see are cute and cartoonish, but this one looks much more powerful and menacing! The costume is made in black and metallic red fabrics and includes a onesie that completely covers the hands and feet for a more real look. It also comes complete with tail, wings and full dragon head! Teenage Mutant Ninja Turtles have been around for decades, but they recently had a bit of a revamp with a brand new live action movie in theatres which has attracted a whole new generation of kids. 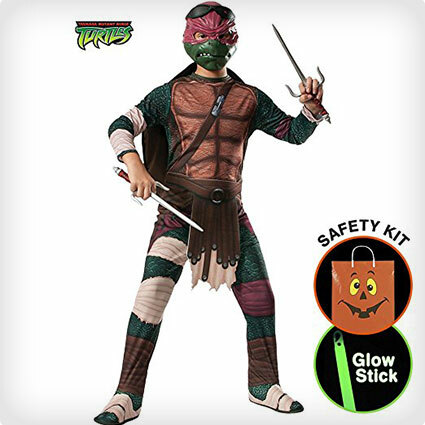 This new Raphael costume is based on the new movies and features everything you need to transform your child into a hero in a half shell. 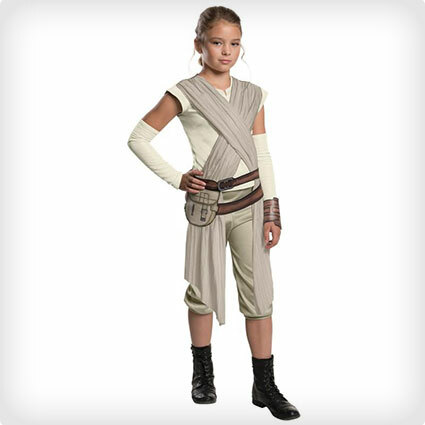 Let her be the biggest star of the most recent Star Wars film with this Deluxe Rey costume from The Force Awakens. Looks just like the real thing from the movie and would be a great addition to a group of Star Wars costumes. 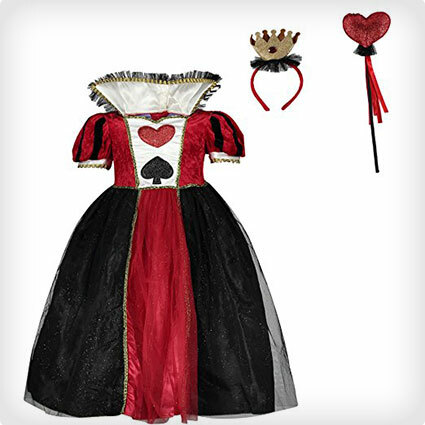 Your daughter will certainly win the hearts of everyone at the party in this pretty Queen of Hearts costume. The costume includes a gorgeous red and black dress with layers of organza fabric and a ruffled collar. It is also supplied with a heart shaped wand and a crown headband to complete the look. We love this costume as it is one of the most unique costumes that we have seen for kids this year. The Voodoo Dolly Costume includes a dress, a heart pin, novelty stick pins as hair accessories and printed stitched hosiery. This is certainly cute, but creepy! Halloween is a chance for children to live out some of their dreams. 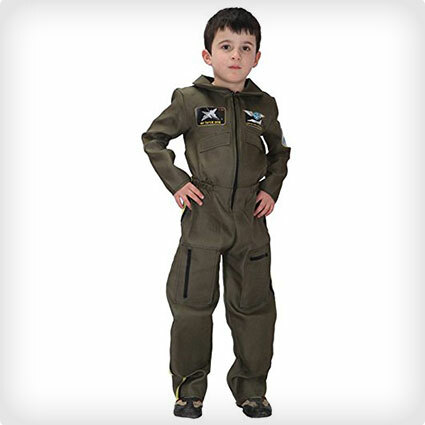 This costume is ideal for any little boy – or girl – who has always wanted to be an air force pilot. The costume includes an all in one jumpsuit with several patches attached to give it an authentic look. Your child will be all ready for adventure on the high seas with this cute pirate costume. It includes 5 separate pieces including a tunic, pants with attached boot covers, hat, sash and eyepatch. 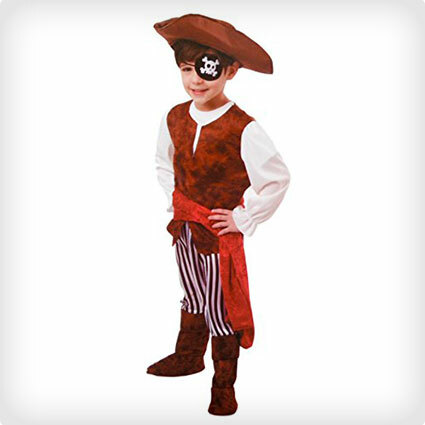 Pirates are always a popular choice, and this high quality costume will go down a storm. 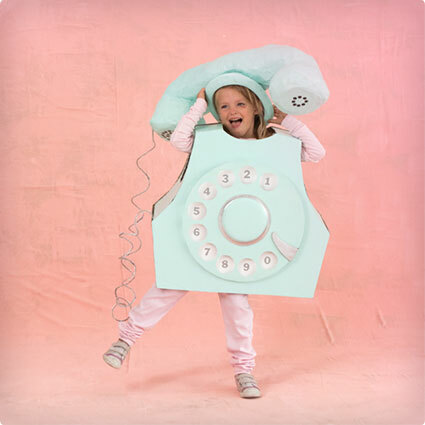 Okay, so your kids may not be old enough to remember the old style rotary phones, but that doesn’t matter, because they are still going to look adorable in this retro costume! This helpful tutorial is going to walk you through the steps required to make this cute phone costume. Who doesn’t love Mario Kart? 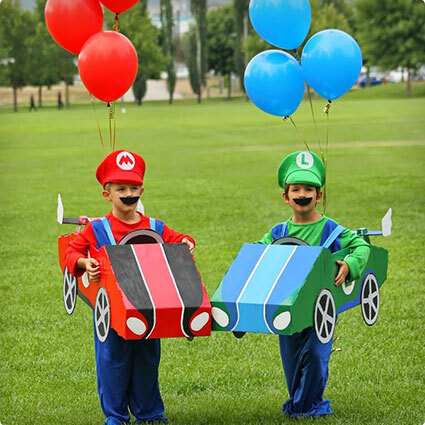 These cute DIY Mario and Luigi costumes complete with go karts are fantastic and you can make your very own versions using this step by step guide. You are going to need plenty of cardboard and spray paint for this one! 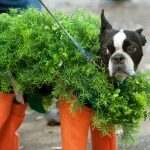 This adorable costume is easy to make. Follow the tutorial and you can soon transform your little one into Max from Where the Wild Things Are. 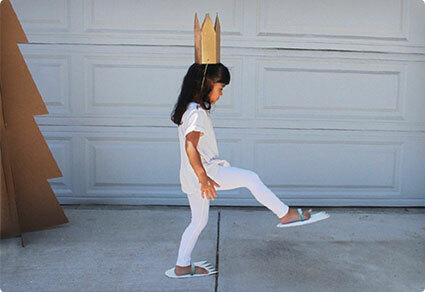 All it takes is some scrap cardboard to create monster feet and a crown. 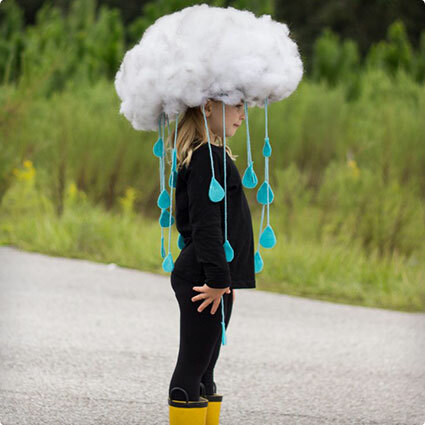 This Rain Cloud costume is so gorgeous, and yet it is so simple to make! The head piece is essentially a cheap party hat that has been covered in cotton wool and then has strings of felt raindrops dangling from it. If you want a cheap option this Halloween then you can pull this whole thing off for just a few dollars. 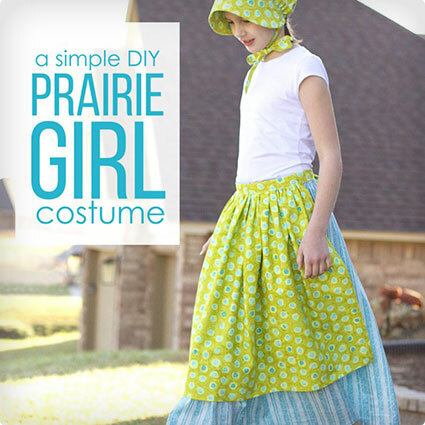 This cute Prairie Girl costume is a great little costume for the last minute. You can knock it together in a matter of hours using fabric scraps that you are likely to already have on hand. It consists of a basic elasticated waist skirt, an apron and a bonnet. Thanks to the launch of the wildly popular Pokemon Go game, there has been a huge resurgence in Pokemon recently. 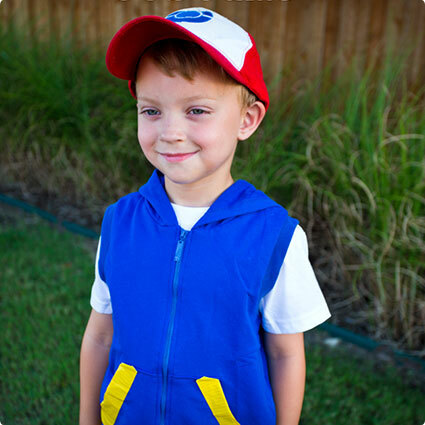 Your kids are going to love this Ash Ketchum costume and since it is no sew you are going to be able to put it together quickly and with little to no fuss. 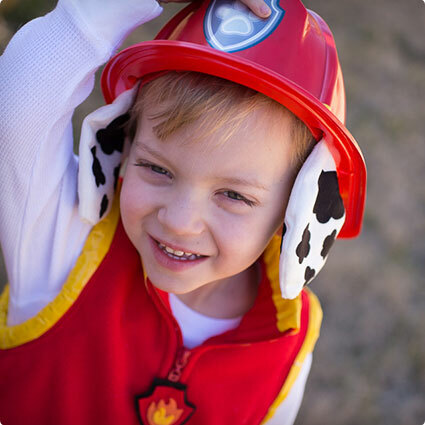 Paw Patrol is another big trend for kids at the moment, so your little ones are going to love being dressed up as one of their favourite characters. With this east to follow ‘no sew’ costume tutorial you are going to be able to whip up a Paw Patrol costume with no fuss.